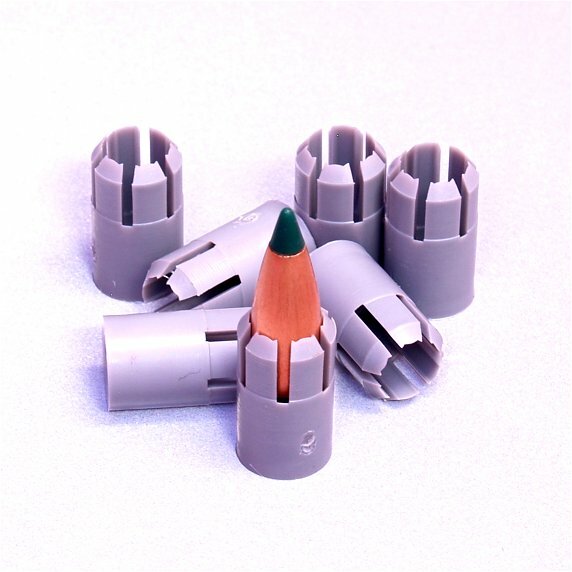 The .224 BOZ is a wildcat cartridge developed in the late 1990s. It is basically an attempt to defeat body armor out of a pistol-sized cartridge, and to all appearances, the attempt was successful. It comes in two versions, the original parent case, which is based on the 10mm Automatic (10x25mm Auto), and another in 9mm, which explains the size differential in the two cartridges featured in the reference image to the right. This installment of the Reloading Press is more about design philosophy and getting the most out of a cartridge than a real-world example of something that was or will be deployed. With that, we’ll look at two ways of using a 10mm cartridge case to launch a pretty neat projectile – the 69-grain “super penetrator” from this PDF file. While I’m sure there’s plenty of marketing hype there, you can’t get too much more “designed as armor piercing” than a long projectile with a tungsten carbide lead penetrator mated on top of a hardened steel core beneath it. There are two ways to launch this one. The .224 BOZ way, and the APDS (Armor Piercing Discarding Sabot) way. Sabot ammunition is very commonly used in KE penetrators for tank guns, and less commonly used in small arms. The .50BMG has a SLAP (saboted light armor piercing) version, and there are nifty “accelerator” rounds that, for example, launch a .223 bullet out of a .308 barrel at 4000+fps, with a mechanism pictured on the right – a plastic sabot cup that fits in the full-caliber cartridge. The APDS pathway is fully supported in GURPS High-Tech. Basic inputs for the calculator are as follows, selecting 117mm for the (test) barrel length. The version presented here is the .224 BOZ, with a 5.7mm 69 grain projectile. The same projectile will be used in both cases. The cartridge develops a healthy velocity of 1442fps (440m/s) out of a 117mm barrel. Fine, but not that impressive necessarily, considering you can fling a much heavier bullet (180gr) at 400m/s out of a 400mm barrel with the bog-standard 10mm. A standout feature of the projectile itself is the outstanding 1/2D range, due to the sectional density. Out of a roughly 9″ barrel, you’re looking at 3d+1(2) pi-. That’s pretty good penetration, actually, but the wound channel requires vitals hits. The heavy recoil of the 10mmAuto might be tamed by the lighter bullet, but maybe not. Now let’s flip over to launching the same projectile out of a full-caliber barrel, from the same cartridge case. That requires only changing the barrel bore to 10mm, and the total accelerated mass to about 15% higher than the launched mass – sabots for .223 from a .30 case only weigh 6 grains, so allowing more for the larger pistol case makes some sense. We’ll assume an 79.5gr total mass. And let’s look at the barrel lengths required to get the same range of performance. Actually, we can’t, because even out of a snubnose barrel, the APDS round simply is better than the full-bore barrel. Why? Force. The pressure is held constant, and the 10mm sabot allows for 3x the force to be applied to the projectile over the same distance. Now, there are a ton of assumptions in the model, the first being the the same cartridge case and the same powder load, or at least same pressure profile, will result in the same psi on the back of the bullet. But given those assumptions, developing a saboted PDW cartridge would seem to be a much, much better design direction than the full-bore 4.6 and 5.7mm projectiles fielded today. In GURPS, certainly this is true. As it turns out, the rule of thumb for APDS is 1.3x damage and add a (2) armor divisor. For a 10mm pistols, you’re probably looking at 3d-1 or 3d damage by the official rules, that would gross up to about 12.3 to 13.6 points, or 4d-1 (2) pi-. Note that out of a 115-125mm barrel (pistol-sized), my calculations give . . . 4d-1 (2) pi-. So if you’re looking for good damage out of short barrels, you might be paying $100 for 50 rounds . . . but you can basically outperform nearly all of the PDWs on the market today with both pistols and SMGs. The major problem with APDS in small arms seems to have been reliability (see the failure of the M962 SLAP); GURPS calling APDS TL 9 in small arms seems reasonable, though the divisions between APDS and APEP seem strange.